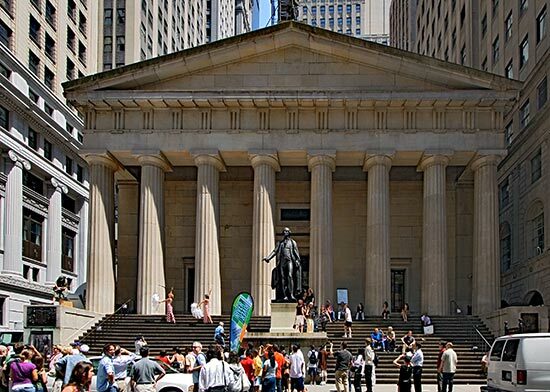 On April 30, 1789 a 6’3″ tall George Washington arrives at Federal Hall in New York City. He is dressed in a plain brown suit and holds a ceremonial sword. Washington is impressive and solemn as he takes the oath of office on the second story balcony of Federal Hall. George Washington is the first President of the United States. After taking the oath of office he goes to the Senate chamber, in the same building, to deliver his inaugural address. The address contains mostly generalities, but he spoke specifically of the need for a strong Constitution and Bill of Rights. Washington took the presidency very seriously and believed he served only at the behest of the people. He served two terms and although he easily could have gained a third term, he retired. He believed presidents should only serve one term and only accepted his second term because the country needed him. Two hundred and nineteen years later, most of the same traditions and procedures for the inauguration of the president remain intact. It is hoped the person who becomes president truly realizes the great privilege and responsibility he has been granted by the people of the United States. 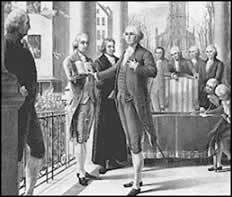 Washington taking the oath on the balcony of the Federal building in NYC in 1789. Federal building today with statue of Washington commemorating the site of the first inauguration of a U.S. President. Vice presidential powers as defined in the Constitution of the United States. Presides over the Senate and casts deciding vote in event of ties. Who was the youngest to serve? John C. Breckinridge at age 36 in 1857.
Who was the oldest to serve? Alben W. Barkley was 75 when he finished his term in 1953. 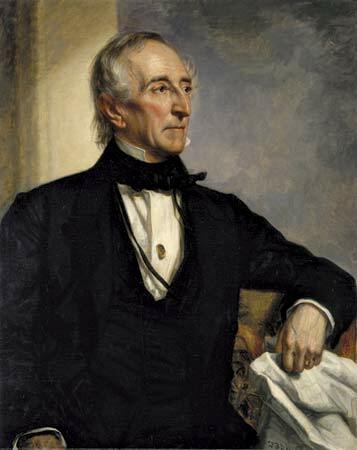 John Tyler (photo above) in 1841 when President William Henry Harrison died after just one month in office. Number who have succeeded to the presidency after the death of a president. Who was the first to die in office? How many have died in office? Seven. George Clinton in 1812, Elbridge Gerry in 1814, William R. King in 1853, Thomas Hendricks in 1885, Garret Hobart in 1899, and James Sherman in 1912.
Who was the most recent to succeed on the death of a president. Lyndon Baines Johnson on November 22, 1963 after the assassination of John F. Kennedy. How many have been elected to the presidency on their own. Nine. John Adams in 1796, Thomas Jefferson in 1800, Martin Van Buren in 1836, Theodore Roosevelt in 1904, Calvin Coolidge in 1924, Harry S. Truman in 1948, Lyndon B. Johnson in 1964, Richard Nixon in 1968, and George H.W. Bush in 1988. What person became vice president and president without being elected to either office? Gerald R. Ford who was appointed Vice President under Richard Nixon. He then succeeded to the presidency when Nixon resigned. What president had three different Vice presidents? President Franklin Roosevelt had John Nance Garner, Henry Wallace and Harry Truman as his Vice Presidents, but then he was elected to four terms. Who was the first resign during his term? John C. Calhoun resigned in December 1832 to take a seat in the Senate. Who was the first female vice presidential candidate from a major political party? Geraldine Ferraro. She was former Vice President Walter Mondale’s running mate in 1984 for the Democratic Party. They lost to President Ronald Reagan and Vice President George H.W. Bush. Have any served under different presidents? Yes. George Clinton under Presidents Thomas Jefferson and James Madison, and John C. Calhoun under Presidents John Quincy Adams and Andrew Jackson. 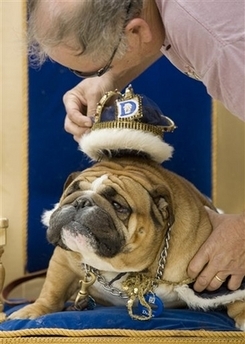 Buddy won the contest to select a mascot for Drake University. Apparently one of his talents is snoring. The contest entrants were all English Bulldogs which made me wonder, if they all looked pretty much the same, how the heck would the judges have decided which one to pick. Guess his snoring talent must have contributed to his win. Some people will do almost anything to keep the kids out of the fridge. This photo accompanied a recent article in the news. 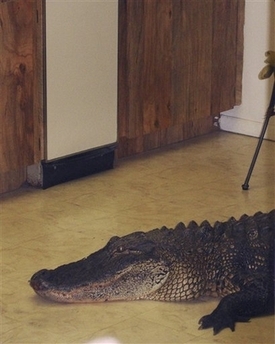 Seems that this full size alligator got into a woman’s house in Florida and headed straight for the kitchen. Gators must be intelligent creatures. This one obviously knew where the food was. Anyway all ended well. Animal control came and took the beast away. I’m willing to bet if she visits the kitchen in the middle of the night she’ll flip the lights on, just to make sure fridge security is no longer in place. I have added a page to this blog called “Nonfiction Writing Project”. I posted an excerpt and status on a nonfiction book I am working on and intend to have published. You will see the Link at the top of the main page. If you are interested please check it out and leave a comment. Okay so maybe it’s not heaven, but it sure can be hell. As one who is forced to commute from the burbs to a workplace in the downtown core I was wondering what the experience of others is or has been. In my case I have a brief five-minute drive to the transit train station, then a 25-30 minute ride to my stop in the core. I walk about three blocks to my office from the station. The parking at the station is free, at least so far. there is talk that the transit authority my force users to pay to park. The transit system here consists of above ground light-rail transit and buses. The Light-Rail system has been in operation since 1981. Parking at the stations has always been free. Sometimes, especially when the thermometer dips sharply in the winter, the trains are late or are taken out of service temporarily. Overall I am satisfied with the service. I use the time to read or listen to music. Making it productive time makes the commute go faster. Driving downtown for me is not an option for a couple of reasons. One parking is either too expensive or not available, and the stress of rush-hour traffic is unbearable. What’s your experience? Leave a comment. Most of all she has demonstrated she can carry the big states like Ohio, New York, Texas, California, Florida, Michigan and Pennsylvania, all of which she won the primaries in. You can see that if a candidate can carry all the large states they would be well on the way to reaching the magic number of 270 Electoral Votes needed to win the presidency. This certainly doesn’t dimish the importance of those states having smaller numbers of Electoral Votes because they would have a major impact in a tight election. The most populous states have the most Electoral Votes because the number of Electors a state has is equal to the number of Senators and Representatives that states sends to Washington as elected officials. The total number of Electoral Votes is 538. A winning candidate in the general election has to win 270 (one more than half). 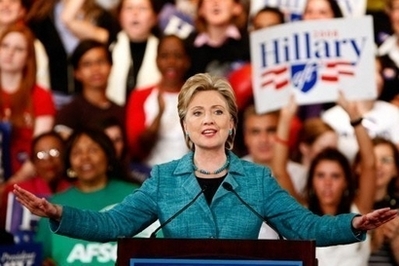 By winning the primaries in those states with the most Electoral Votes available in the general election Hillary Clinton hopes to be able to convince the unpledged “super-delegates” to support her. If she can do that, she will win the nomination. You are currently browsing the WRITINGS & RAMBLINGS blog archives for April, 2008.